New Cub Scout Advancement Modifications have been made. It is very important that all Cub Scout Leaders & Parents are notified of these changes. Click here for the Updated Advancement Information. LDS Scout Leader Training Guidelines? Council Blog - The Boy Scout .Search "Cub Scout"
Pinterest has great ideas. Go to Cub Scouts Iron Horse District and follow. Pick them up at the Council Office with no extra charge or shipped directly to your home for $5! Roundtable is held at 7:00 pm on the first Thursday of each month at 650 East 3200 North in Lehi. Iron Horse District CUB SCOUT Facebook page. LIKE us on Facebook!! Iron Horse District Facebook page Keep up to date on events, updates, and other Scouting related news. 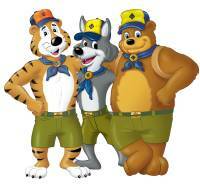 Changes are coming to the Cub Scout Program in 2015. Here is an article describing the changes.